It has become quite time consuming to stay up to date with the ever increasing threats that Spectre and Meltdown pose to computer systems around the world. New variants pop up regularly, and manufacturers like Intel and AMD, and software developers like Microsoft, release advisories, updates, and instructions regularly for some but not all hardware or software that are affected potentially. While you have probably done a bit of patching already to protect against some variants, you are not done yet. Microsoft updated an advisory on today's Patch Day that includes instructions on enabling protection against Speculative Store Bypass (SSB) in Intel and AMD processors. The update requires that microcode or firmware updates are installed on target machines running Intel processors. AMD systems don't require microcode updates according to Microsoft. Install the June 2018 security updates for your operating system (client and server supported, see chart below). Install the firmware or microcode update for Intel machines when released by Intel. Modify the Registry to enable the protection. Question is: should you enable the protection? Microsoft did not enable it by default but revealed that it will enable the protection automatically if it notices exploits that are in the wild. Installing the update won't affect performance according to Microsoft but enabling the protection in the the Registry will have an impact on the device's performance; this is the most likely reason why Microsoft did not enable the protection by default. The following table shows the vulnerabilities and their default state on all supported versions of Windows. Note: We recommend that you backup the Registry or create a system backup before you run these commands. 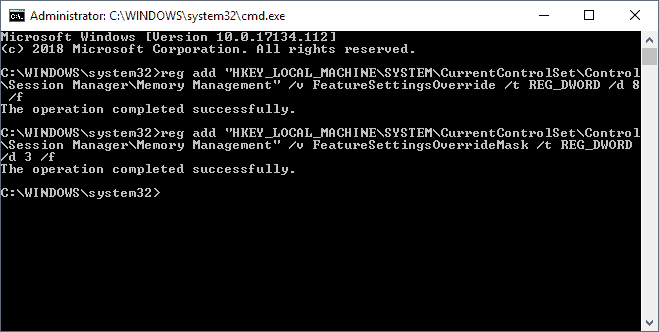 Open an elevated command prompt by clicking on Start, typing cmd.exe, holding down the Shift-key and the Ctrl-key, before selecting the Command Prompt result. See KB4073119 for additional information or updates. Microsoft updated an advisory on today's Patch Day that includes instructions on enabling protection against Speculative Store Bypass Disable (SSBD) in Intel and AMD processors. This is all supported versions of Windows. As MSI hasn’t released a new bios for my MOBO (and probably nerver will) does any of this spectre/Meltdown mitigation even apply to my hardware? I am running an i5-4670 on a MSI Z87-G43 Gaming and an i7-4790K on a MSI Z87-GD65 Gaming. You have made it clear what is required for AMD but not Intel, can you please clarify? You need to run the commands under 3) on Intel systems. To be honest, I’m concerned about protecting Windows against Microsoft’s incompetence. Dear Martin, please don’t spread fake news. The registry for Speculative Store Bypass ( ADV180012 CVE-2018-3639 ) in your post doesn’t do anything. Even if you enable it, the protection is not enabled at all. One will need microcode update from Intel/AMD for the protection to be enabled. Note: for ADV180013 Rogue System Register Read CVE-2018-3640, a microcode update is required as well. Now, Intel hasn’t officially release microcode update with SSBD MSR yet. So, even with the registry being enabled, there is NO PROTECTION against CVE-2018-3639 and CVE-2018-3640. Yep. You are right. Have just tried this and nothing. Using the powershell commands to check if speculative store bypass vulnerability protection is enabled and it still says vulnerable so. Got a ryzen 5 1600x. Guess we gotta wait for new microcode/bios updates again xD. The registry for Speculative Store Bypass are only for IT and servers? home computers no? Microsoft’s description and instructions are really bad. I understood it that it is for all client and server versions, not only for server. Yes if this is enabled performance will drop but Microsoft did not reveal by how much. I run Windows 8.1. I uninstalled a previous Windows update which provided Meltdowh protection as it slowed my computer too much (my computer is 5 years old). As there is not a single Meltdown or Spectre exploit in the wild, AFAIK, I prefer to take my chances. I have backups. I won’t be making further modifications to my system for this malware. Would it be a generation of Intel or AMD microprocessors that don’t “include” these Meltdown and Spectre weaknesses? You mean if new processors that got released after Spectre/Meltdown reveal exist? I’m not 100% sure on this but you probably have to wait a bit longer before you can buy Intel processors that are not vulnerable. Why bother ? The Spectre/Meltdown has been around since many, many, years back. Still i haven’t heard anything that these exploits are (ab)used. To me this is quite ridicilous news…. If patches affect computers negative i don’t bother install them. I am still on XP x64 and 7 x64 plus some Linux dists. ” Why bother ? The Spectre/Meltdown has been around since many, many, years back. Still i haven’t heard anything that these exploits are (ab)used.”…………….totally agree ! We are always toooo late , when new malware arrives , while security-updates never speed-up your OS ! Only real working solution is making backups regulary ………….!!! I disabled spectre and meltdown , it made my system slower , while the checker “said” performance ; good ! 1) “…enabling protection against Speculative Store Bypass Disable (SSBD)” – SSBD is not the name of the vulnerability. It’s the name of the protection (it disables SSB). 2) The table is incorrect – At least Windows Server 2012 R2 is not affected by this vulnerability. 4) Steps to disable the SSBD protection are “a way to hell” – There is no reason to delete registry key FeatureSettingsOverrideMask as it just defines the bit mask. You should not delete the FeatureSettingsOverride either, because you will disable the protection against ALL vulnerabilities. You should change the (bit-based) value according to the desired state (0 = protection against Variant 2 and Variant 3 activated, protection againt Variant 4 deactivated). You can use InSpectre to (de)activate the protections individually. Thank you for your input. The table comes from Microsoft, has the company updated it?